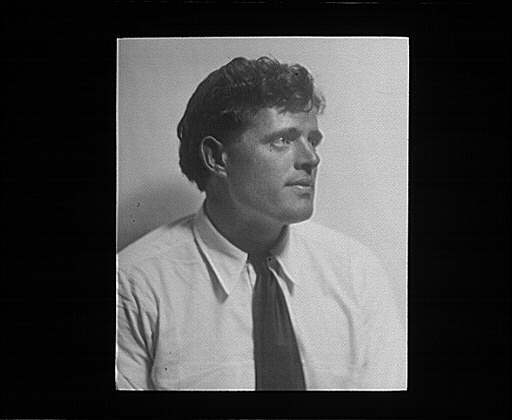 Jack London in 1906, roughly the time when he would have written the essay. I shall never forget the first big wave I caught out there in the deep water. I saw it coming, turned my back on it and paddled for dear life. Faster and faster my board went, till it seemed my arms would drop off. What was happening behind me I could not tell. One cannot look behind and paddle the windmill stroke. I heard the crest of the wave hissing and churning, and then my board was lifted and flung forward. I scarcely knew what happened the first half- minute. Though I kept my eyes open, I could not see anything, for I was buried in the rushing white of the crest. But I did not mind. I was chiefly conscious of ecstatic bliss at having caught the wave. At the end, of the half-minute, however, I began to see things, and to breathe. I saw that three feet of the nose of my board was clear out of water and riding on the air. I shifted my weight forward, and made the nose come down. Then I lay, quite at rest in the midst of the wild movement, and watched the shore and the bathers on the beach grow distinct. I didn’t cover quite a quarter of a mile on that wave, because, to prevent the board from diving, I shifted my weight back, but shifted it too far and fell down the rear slope of the wave. It was my second day at surf-riding, and I was quite proud of myself. I stayed out there four hours, and when it was over, I was resolved that on the morrow I’d come in standing up. It took London a long time to figure out how to ride the waves, and when he finally got it, he didn’t make it all the way in. But he gloried in the experience, learned from it, and used his failure for fodder to improve. Do the same. Incidentally, he was too sunburnt to surf again the next day. But after a couple weeks, he was back up, and Jack London made it to the beach many, many times.